If you read Part I, then you know that I recently got my PADI Open Water Certification. 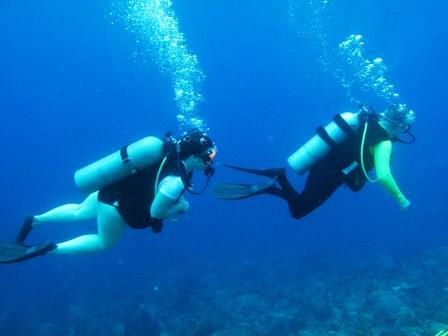 I just returned from a vacation in St. Lucia where I did my first real ocean dives and it was a great experience. We stayed at an all-inclusive where the diving was also included. When we arrived at the resort, we checked in with the onsite dive shop – we provided our certification cards, filled out the forms, and signed up for dives. It was nice to be able to provide my official card representing my accomplishment. The staff recommended an easy, 1-tank orientation dive the next day which I did. It was a great way to transition from Dutch Springs to the ocean. :) Amazingly, I saw a big beautiful moray eel on the first dive – out in the open and not peeking out of a hole! We did 7 other dives on our trip and saw other wonderful things, including a baby octopus, starfish, rays, and countless beautiful fish. Despite the less than scenic dive conditions in Pennsylvania, I was very glad I did my certification here at home rather than during my vacation. My instructors knew my needs as a student and it saved time and stress while on holiday. My thanks again to the folks at Aquahut for the great training. I was able to relax on my vacation and not worry about the normal stresses that come with a new activity. I’m looking forward to my next diving adventure!